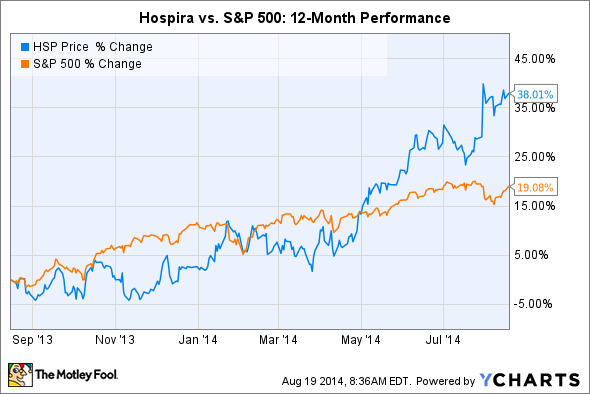 Let’s take a look at three reasons Hospira’s stock could soar to new highs. Shares of Hospira (UNKNOWN:HSP.DL) have rallied nicely over the past 12 months, handily outperforming the broader market and closing in on all-time highs. Last quarter, the maker of specialty injectable pharmaceuticals (SIP) and medical devices reported that its revenue rose 11% year-over-year to $1.1 billion, while its adjusted earnings per share rose 31% to $0.72 per share. 69% of Hospira's top line comes from its SIP segment, 19% comes from medication management devices, and the rest comes from other pharmaceutical products. It topped off those robust earnings by raising its top and bottom line guidance for the full year. The key question now is whether or not Hospira's stock can keep climbing, so let's study the three most bullish cases for Hospira's continued growth. But before we get started, investors should remember that although these points highlight Hospira's greatest strengths, they do not guarantee that the stock will soar to new highs. The global market for biosimilars, or generic versions of biologic drugs, is expected to grow from $1.3 billion in 2013 to $35 billion in 2020, according to Allied Market Research. The reason is simple -- more than ten blockbuster biologic drugs with combined annual sales of $60 billion will lose patent protection in the U.S. and Europe over the next four years. Hospira has a strong pipeline of 11 biosimilars, some shared with Celltrion and Novaquest. Hospira's Inflectra, which is a biosimilar version of Johnson & Johnson and Merck's rheumatoid arthritis drug Remicade, was approved in Europe last year and launched in several countries in Eastern Europe. Remicade's patents are protected throughout most of Europe until February 2015 and in the U.S. until September 2018. Remicade respectively generated $6.67 billion and $2.27 billion in revenue for Johnson & Johnson and Merck in 2013. Therefore, Hospira's portfolio of biosimilar versions of blockbuster drugs is expected to fuel stronger top line growth as additional patents expire in the U.S. over the next few years. One of Hospira's biggest problems in the past was its plant in Rocky Mount, North Carolina, which has been scrutinized by the FDA since 2011. The company has reportedly spent $487.5 million over the past three years on product and quality charges, mostly related to upgrading the plant. Besides being a weight on its bottom line, the plant was also bad PR for the company, which has suffered similar manufacturing issues in India and Costa Rica. The embargo of pumps made at its Costa Rica plant, issued by federal regulators last February, has further weighed on growth. In late July, CEO F. Michael Ball announced that the FDA finally cleared its Rocky Mount plant with no observations -- down from over 20 observations that the plant was originally slapped with. That's a highly positive development which indicates that Hospira's efforts are paying off, and hopefully provides a roadmap for Hospira to solve similar issues in India and Costa Rica. Many U.S. companies have recently lowered their corporate taxes by buying smaller companies in lower-tax nations like Ireland, then moving their headquarters overseas. Companies like Actavis, AbbVie, and Medtronic have all recently adopted that controversial strategy, known as tax inversion. A move from the U.S. to Ireland, for example, could theoretically drop a company's corporate tax rate from as high as 40% to 12.5%. According to The Wall Street Journal, in late July, Hospira was in talks to purchase Danone's medical nutrition unit for $5 billion to move its headquarters from Illinois to France, which has a 33% corporate tax rate. If Hospira makes the move, it would not only boost its bottom line in the long run, but also diversify its portfolio away from injectables and pumps. Danone's medical nutrition unit generated €1.3 billion in revenue ($1.7 billion) last year -- which would make it a huge new division for Hospira, which reported $4 billion in revenues in 2013. In conclusion, Hospira could certainly climb higher in the future. Its biosimilars portfolio has strong growth potential, it has taken steps to help its plants meet regulatory standards, and it could grow its bottom line and diversify its top line by acquiring Danone's medical nutrition business.